Kourou, main character of the movie, goes from his village to Kinshasa, his heart full of dreams of music and success. The capital city of Zaire is then the center of “World Music”. 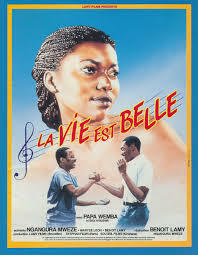 Once there, he falls in love with Kabibi, a virginal young woman who wants to be a secretary. Unfortunately Nvouandou, a club owner searching for a second wife, also wants to marry her (1). Nvouandou tried so hard to conquer Kabibi’s heart, but fails. Her heart already belonged to some one else, Kourou. Even though it was not an easy battle for the young couple, they finally made it together. "La Vie Est Belle." La Vie Est Belle. FONDO FILMICO, n.d. Web. 08 Dec. 2014. "Life Is Rosy (1987) Film: 'La Vie Est Belle'" The New York Times. Janet Maslin, 18 Nov. 1987. Web. 8 Dec. 2014.